Scout Groups Love our Campground! Located only 1 hour from Chicago! Our private Campground is PERFECT for the BEGINNER camper! Camp with your vehicle just steps from your tent. WE are right on the water! 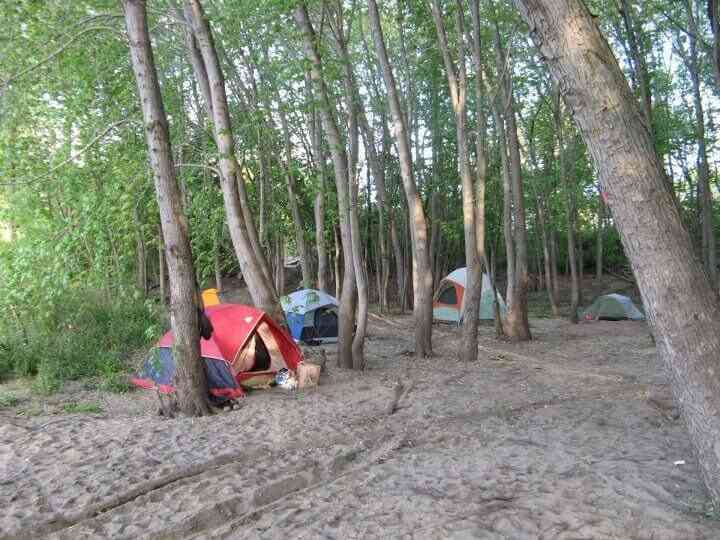 All sites are Fully wooded Sandy Beach camping(within 10-30yards). KayakMorris Outdoor Learning Campground is a new concept in recreational fun for all. KayakMorris’ Campground was created out of a need to connect a variety of people and groups to recreational land and outdoor experiential learning programs and features GLampOut events! BOOK A DAILY KAYAK RENTAL AND GET FREE CAMPING! We are combining easy access to kayaking, biking, canoeing, fishing, geocaching and hiking all in one great place! We make it FUN! We are even just steps away from historic downtown Morris, which features antique shops, novelty stores and great restaurants. We feature full sand beaches on the Illinois River and we are adjacent to the historic I & M canal and towpath featuring fishing, hiking, biking and geocaching. Scroll down to book now! Our Campground is specifically for families, youth and those with the utmost respect for the Great Outdoors! We cater to those that seek to escape to the wilderness and spend relaxing time with their friends and family. We pride ourselves in limiting camping privileges to families, youth and those that are truly outdoor enthusiasts. You must be 21 y.o. to make a camping reservation. If anyone in the camping reservation is under 21 then someone 20 years older must be present at all times camping with the person(s) under 21. Don’t want to camp alone? DON’T WANNA CAMP ON YOUR OWN? OR JUST WANT THE CONVENIENCE OF A DINNER AND BREAKFAST? Wanna Camp on your own but have the convenience of having a dinner and breakfast included? Just roll in for dinner and breakfast and roll back to your own camping area. We have campers that join us that want the convenience of the GLAMPOUT amenities but the solace of camping on your own. No worries. You can camp as close to or as far away from others as you want.